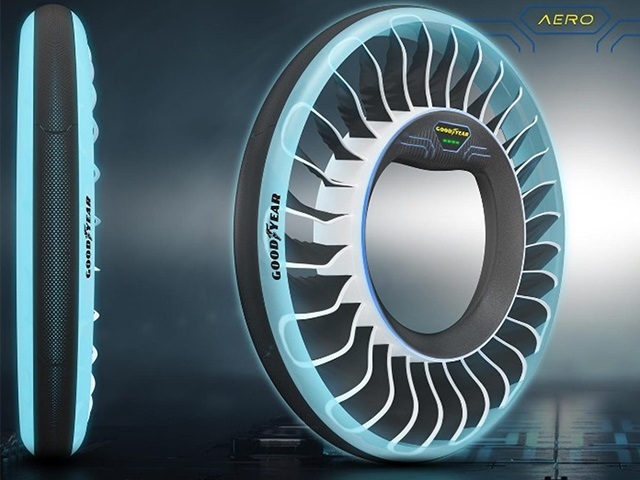 Goodyear’s concept tyres aim to stretch the imagination and spark a debate on future mobility challenges and the tyres and associated technologies needed to address them. While they are purely conceptual designs, some of the featured technologies within these tyres – such as non-pneumatic structures or intelligent tyre capabilities – are inspired by existing products or ongoing research and development projects in the company. Other parts of the concepts, and the thinking behind, might become the basis for future mobility solutions. With mobility companies looking to the sky for the answer to the challenges of urban transport and congestion, our work on advanced tyre architectures and materials led us to imagine a multimodal wheel that could serve both as a traditional tyre for driving on the road and a “propeller” for flying through the sky. With capable vehicles, the AERO would give future commuters the freedom to move seamlessly from the road to the sky. The Golden Sahara II is an iconic custom car of the 1950s and 60s, it was one of the first concepts of autonomous vehicles. Goodyear developed revolutionary tyres made of neothane specifically for the Golden Sahara II. The wheels were made with “glass” hubcaps that could illuminate and act as turn signals, and the tyres themselves were developed by Goodyear to contain internal illumination – allowing them to glow. This was part of a larger experiment, where Goodyear was researching the feasibility of translucent tyres which could help improve visibility in bad weather conditions or be wired to light up when a driver hit the brakes. To generate mobility solutions involving tyres – and even beyond tyres – we are actively working with key players to understand the trends shaping the new mobility ecosystem. Our work on autonomous vehicle projects, such as the Olli, is another mile marker on our journey to future mobility solutions. To learn more about Local Motors and the Olli, visit their website. The SuperSport range delivers performance for motorists who want to get the most out of their driving experience. These are tyres that don’t just make you faster around the track, they provide the unmeasurable enjoyment that is the driving experience, both on the track and the road.